That’s the hallmark of an ideal producer payroll system. How often does a lack of flexibility in your current system impact service to producers? 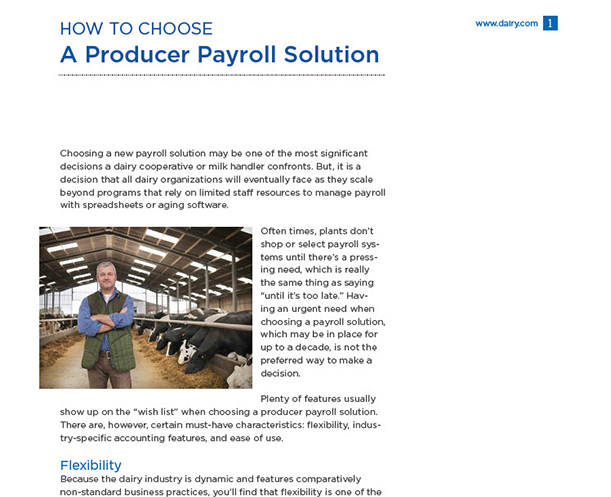 Dairy.com Producer Payroll 2.0 provides an entirely new level of flexibility to help you deliver better service to producers. In addition to our Software-as-a-Service solution, Producer Payroll is available as a managed service and can be extended through Producer Portals. Do you wait on programmers for simple changes to Pay Programs, Pay Groups, or Formulas? Introducing the industry’s most flexible producer payroll solution. You’re in control: Agreements (Producer, Hauler, and Assignee Pay Rules), Pay Groups, Formulas, Volume Premiums, Quality Incentives, and more. They make it easier to manage people and processes and to standardize processes online. Use one of 30+ pre-defined workflow steps or create your own. Transactions adhere to accounting standards, providing enhanced reporting through granular data. 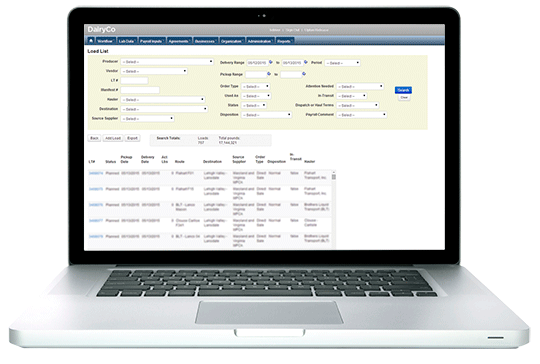 Producer Payroll integrates seamlessly with our Milk Solutions Suite, including Dispatch, Mobile Manifest, Portals (online producer access, discussed below), and Receiving. Automate the creation of bi-monthly pay statements and the calculation of payments to producers and haulers. Producer Payroll can generate payment instructions (as printed checks or ACH instructions) and provides regulatory reporting. Helping plants and co-ops improve document handling with a simple, secure solution. In the Market? How Will You Choose? Producer Payroll is available as a managed service and can be extended through Producer Portals. By phone: Producers can access milk lab results by telephone via the Dairy.com Producer Interactive Voice Response (IVR) application. Using a toll-free number, producers access milk test results with their Personal Identification Number (PIN). IVR technology provides valuable, timely information to producers in the field.